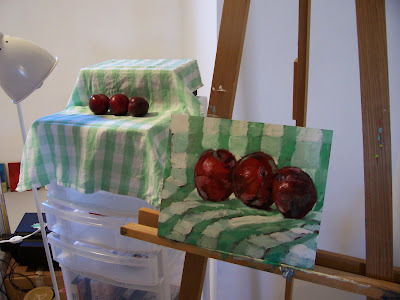 It all started with a larger painting that I am starting and I was waiting for my underpainting to dry so I picked up the glass and striped bag and headed to work, then after the kids went to bed at night I was waiting for another layer on that larger painting to dry so I grabbed some plums that are just about ready to melt they are so ripe. I do recommend having someone read a really good book to you while you paint. It really distracts your left brain and keeps it occupied while your right brain can go all out and just create it's heart out. I wasn't thinking at all about the plums I was just seeing and doing, seeing and doing and I really think it shows. The last few posts look great! Enjoy your new space! Contact me about commission work. Professional Artist and Art Instructor. I have my BFA from the UofA. I have to create art. There is something deeply rooted in me that forces me to communicate myself visually. All my ideas are visual. I learn visually. Through teaching others and working next to other artists I end up learning so much. Light in Life, both in people and our surroundings, inspire me. Please note that the color of the photos displayed may differ from the original painting due to the digital camera's results and the viewers monitor settings. I, Daphne Cote, retain the reproduction rights to the artwork posted on this blog unless otherwise stated.